One of the most tedious and necessary parts of the wedding process is the writing of the thank you cards. Even though they can be a lot of work, you really need to make sure you check this off your list of to do’s – you’ll feel so much better once they’re signed, sealed, and delivered. But you may be worrying more about what to say in them than actually getting them written out. Have no fear in that department because today we’re providing solid examples of different types of thank you’s you’ll have to write. These can be a catalyst to a loving, personalized letter to any of your family and friends – and the helpers – who supported the celebration. Let’s have a peek, shall we? Don’t wait. Try to get these sent as soon as you can. Of course, enjoy your honeymoon and get settled into your newlywed home first. We advise you not to wait months though. Buy the cards along with the rest of your stationery. They’ll match the rest of the scheme, but more importantly, it’ll be less a worry to forget that you need to finish the task if you already have the tools to get it done. You don’t have to write too much. These aren’t page-long letters. Instead, they’re short notes to show your gratefulness. Don’t stress about it. Try to personalize as best as you can. The more details and customized phrasing, the more love and appreciation will be felt from the recipient. 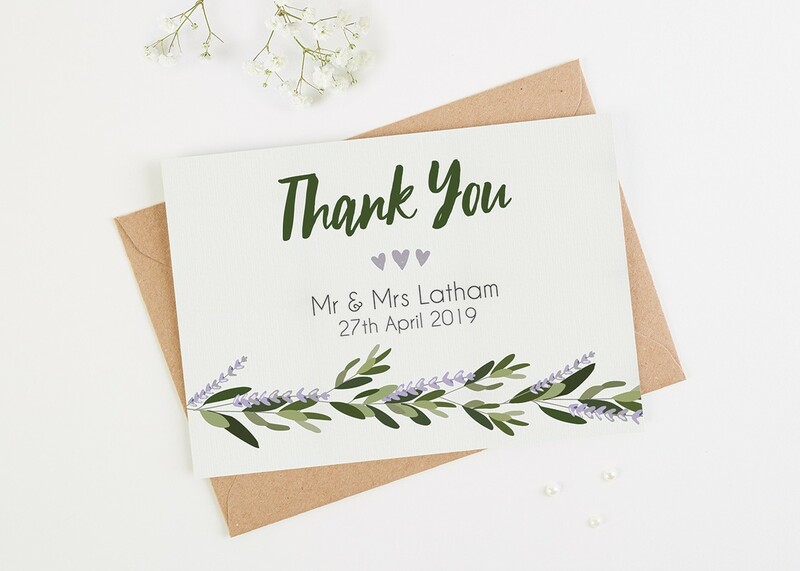 For those that didn’t give a gift but attended the weddings – they deserve a thank you too. These people gifted you with their time and that’s special as well. Thank you so much for the terrific cutlery set you gave us for our wedding! It’s already coming in handy with meal prep, and the knife block looks sharp on our kitchen counter. We’re touched by your thoughtfulness and thrilled that you were able to make it to the wedding, too. Having you there to share our special day with us meant so much to us. Thank you again! Thank you so much for attending our wedding! We had the best time and were so happy you were there. We are so appreciative of your generous gift and look forward to [adding it to our new car fund, using it to put a down payment on a house, adding it to our honeymoon fund, etc]. Thank you again for joining in the celebration of our marriage. Thank you so much for being there on our wedding day, you helped make it truly unforgettable. It meant the world to us that we could celebrate with you. We hope you enjoyed the day as much as we did. Thank you for sharing our special day with us, and for the very lovely gift. We will cherish the crystal vase for a lifetime. Thank you so very much for your thoughtful donation to Orangutan Foundation International. After traveling to Indonesia we both feel very strongly and passionately about this organization, and we are so touched that you remembered our wishes on our special day. My wedding would not have been complete without your love and support. I can’t thank you enough for being my bridesmaid and playing such a special part in my wedding. I would not have gotten through it without you! I hope you had as much fun as I did. Thanks for being a truly amazing friend! Can’t wait to tell you all about the honeymoon and newly married life. You are an absolutely amazing wedding planner! You’re professional, poised and gracious at all times. Thank you so much for being there for me from start to finish, being so patient with me, and putting up with all of my Mom’s worried phone calls, questions and last-minute changes. Our wedding was beautiful and glamorous. It was the day I had always dreamed of. The flowers, decorations and outdoor lighting at the reception were stunningly gorgeous. And the band you helped us select was so awesome. Thanks to you, Brad and I were able to fully enjoy our wedding day without a worry in the world! Please do not hesitate to use us as a reference for other brides and grooms looking for a wonderful wedding planner for their special day. We cannot express the happiness you have brought us. Thank you for officiating our wedding. You helped us create a beautiful ceremony that we will always remember. We sincerely thank you for celebrating our joy and for being a part of our special day.